When it's time to get lean and show off that hard earned muscle, you need a fat burner that actually burns fat! 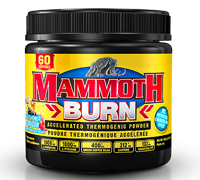 Mammoth Burn is designed to specifically help with the mobilization and oxidation of fat stores. This ensure that fat burning is your body's primary source of fuel, helping you get shredded faster. Mammoth Burn has taken a multi-faceted approach to fat burning, included in the formula are proven mood and energy enhancers to make diet season a little easier. Helps increase physical performance during intensive exercise. Helps support fat metabolism, temporarily relieve fatigue, promote endurance and enhance motor performance. Recommended duration: For use beyond 12 weeks, consult a health care practitioner. Cautions & warnings: Ensure to adequately hydrate before, during and after exercise. Consult a Health care practitioner before using this product if you meet any of the following criteria: taking prescription medication; have liver disease or a seizure disorder; following a low protein diet; taking lithium; high blood pressure, glaucoma, and/or detrusor instability; are of child-bearing age; cardiovascular disease, hypertension, diabetes or prostate disorder; taking other diuretics. Consuption with any other product that increases blood pressure is not recommended. 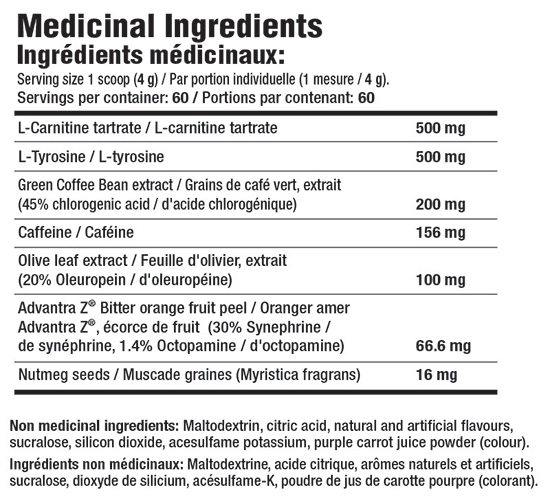 Consumption with other caffeine-containing products is not recommended as it may increase the risk of adverse effects. DO NOT USE THIS PRODUCT if you are: pregnant, breastfeeding, taking decongestant-containing cold preparations (i.e. phenylephrine or pseudoephedrine), or any medication that may increase blood pressure including ephedra or ephedrine.